Sausage Party hits theaters this weekend and luckily we got the chance to interview the film’s directors Greg Tiernan and Conrad Vernon. From the title alone, we all knew that the film’s R-Rating placed it in a league of its own but we were curious about the early beginnings of the party. Who approached who and how was the voice cast assembled? We wondered what it was like to pioneer a project that was meant to shatter everyone’s preconceptions about animated movies. We learn all that and tons more! So, if you’re interested in finding out how the sausages got made then keep reading! 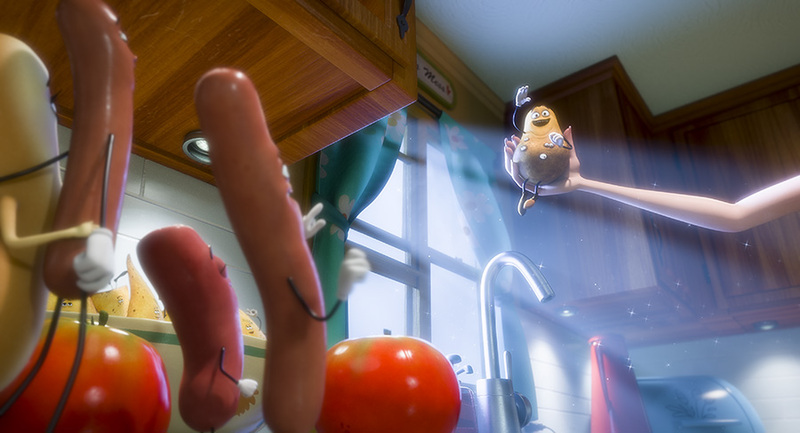 Potatoe (Greg Tiernan) in Columbia Pictures’ SAUSAGE PARTY. You’ve both done some amazing work in animated Children’s stories, was this process different or more difficult given the film’s Adult audience? Thank you. The process of putting an animated production together is pretty much the same whether it’s aimed at children or adults. Crafting the story and the look of the film is of course very different. Each have their challenges and difficulties. The process for me was the same. I approached making this movie and telling the story the same way I would approach making any of the other animated films I’ve directed. The camera work, telling the story clearly, the addition of jokes etc. Did you enjoy it more? Seth Rogan has commented that he initially had trouble getting people interested in the project, when did you hear about it and at what point did you get involved? I’m fortunate in that I love animation period. Whether it’s family entertainment or R-Rated, it’s all animation to me and I love it all. It was a hard sell to get interest in the movie at first because R-Rated CGI animation has never been done before. There’s no track record of movies to compare it to for potential investors and studio backing. The live action studios who initially looked at the project had no idea how to handle animation and the animation studios weren’t prepared to risk sullying their family friendly brands with a R-Rated animated movie. Megan Ellison wasn’t afraid of any of any of that and we’re very grateful for the faith she had in us and on Sausage Party. Seth called me after we had finished working together on Monsters Vs. Aliens and asked if I’d be interested in hearing a pitch. I went to his house and Evan and Jonah were there to pitch the movie. I instantly said yes!! They had very little trouble piquing my interest. I have wanted to do a rated R animated film ever since I saw the Heavy Metal trailer when I was 13 years old. This was my chance to do it! The idea of making an adult R-Rated animated CG movie and showing that there is a legitimate adult audience for it. Knocking down the walls that keeps all animated films to one audience. R-Rated super funny animated movie written by Seth Rogen, Evan Goldberg, Kyle Hunter and Ariel Shaffir, getting to direct alongside my old buddy the super talented Conrad Vernon and actually getting to make the movie with my wife, Nicole, at our own studio, Nitrogen Studios in Vancouver. The decision to do the movie was a no brainer. Do you feel that there is a market for more films like this? I certainly hope so. Time, and the box office, will tell. That’s what we’re out to prove. I think so. Douche (Nick Kroll) and Popped Cherry Mixer (Maryke Hendrikse) in Columbia Pictures’ SAUSAGE PARTY. What was your favorite part of making this film and what did you find the most challenging? At what point in the creative process for the film did you have an idea of the voice talent you wanted to use? I love every part of the process. I love seeing the film move from department to department and become more realized. But on animated films there’s ALWAYS a moment when you ask yourself whether or not you’re going actually finish on time and on budget. The actors were all brought in by Seth and Evan. They called in favors to everyone they had worked with in the past and all of them were really excited to be a part of this! My favorite part of making this movie was also the most challenging. It was proving that we could put 85 minutes of top drawer CGI animation on the screen at a fraction of the cost of a typical animated feature film and debunk two myths at once—that animation is for kids and that the big Hollywood studio way of making animated movies is the best and only way to make them. Seth and Evan had ideas on the voice talent right from the beginning and we collectively considered a host of different possibilities before we chose the final cast. How was it working with such a diverse range of talents? Everyone from Nick Kroll, to Salma Hayek, to Edward Norton. It was amazing. Each and every one of these supremely talented actors was hilariously funny and brought so much to the project. From the first table reads to the final studio records it was a privilege and a pleasure to work with them. Loved everyone I was fortunate enough to work with. Salma and Edward were unbelievably funny, and they stepped right up and held their own with the really, really, funny people that filled out the rest of the cast. Nick, in particular, had so many takes and improv lines that it took forever to run through the takes, but it was pretty funny!! Was the script you had on day one changed at all over the course of making the film? Was there much room for improv or new ideas along the way? The story is pretty much the same but all of act three was re-written at one point. There were constant tweaks to the dialogue and emotions of the story. During the recording process Seth, Evan Greg, Kyle Ariel and myself were all in the room so there were plenty of improv lines. Some even changed the course of the story themselves. For instance the running gags of food puns douche runs into throughout the movie was come up with during a Nick Kroll record. Yes, the script evolved and changed a lot during the production but always with the aim of making the story stronger and the comedy even funnier. Seth and Evan never shy away from wielding a meat cleaver and chopping out material if it’s getting in the way of the story. There was lots of improv along the way and lots of new ideas from everybody involved. It was awesome to be part of such a collaborative team. What do you hope this movie achieves in the film industry? Opening up a new market for animated films. Not just kids/family-friendly animation, but animated films that can be Rated-R as well as dramatic, romantic and edgier than what the public is used to seeing from an animated movie. Brenda (Kristen Wiig) and Teresa (Salma Hayek) in Columbia Pictures’ SAUSAGE PARTY. How does directing an R-Rated film compare to directing more family-oriented films? Which is more fun? Or are they both fun in their own, unique way? They are both fun to do. I love animation so if the story is great and it’s got style then the rating doesn’t matter. That being said, it was nice to not have to worry about whether or not certain jokes were going to get in. Have you always been interested in working in animation? I’ve always loved animation but it didn’t occur to me as a career option until I saw Roger Rabbit. What are the possibilities of a Sausage Party crossover with other franchises you’ve worked on? I don’t think any! 🙂 I don’t think DreamWorks is going to be interested in rated R fare. Given all of the Nickelodeon nostalgia and reboots happening, Ren & Stimpy and/or Rocko’s Modern Life seem like a good fit. Finally, we’ve seen the market for raunchy, adult cartoons on television open up tremendously over the years. 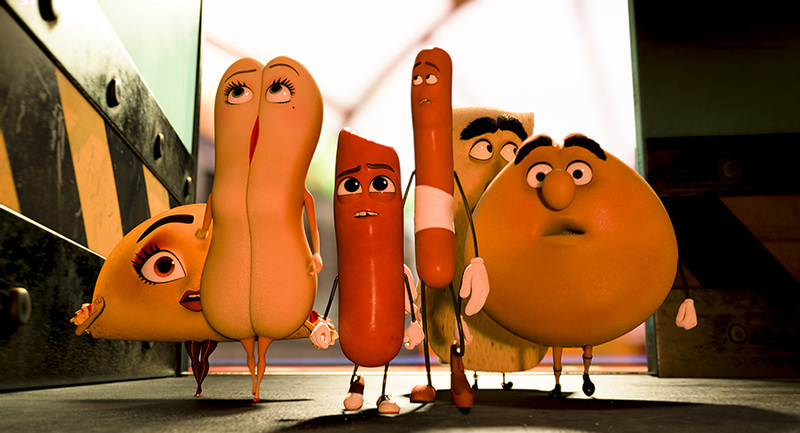 Do you think Sausage Party will open the doors to more R-Rated animated films? I certainly hope so! As in question one it’s my hope for the film. To prove adult animation has a legitimate audience. Do you feel you are the torch bearers for R-Rated animated feature films? At this moment yes, but it’s been passed on to us by Trey Parker and Matt Stone, the makers of the Heavy Metal movie and perhaps most importantly of all Ralph Bakshi who in my opinion lit the torch to begin with. Absolutely—I think the pioneers like the great Ralph Bakshi, Trey Parker and Matt Stone and also Seth McFarlane laid the groundwork, but for big cinematic CGI Pixar style features I do believe that we are the torch bearers.